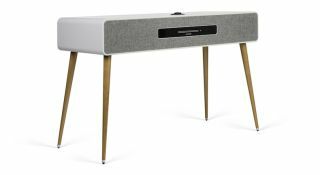 Ruark announces third-gen R7 radiogram with multiroom support | What Hi-Fi? Ruark Audio has re-refined its beloved radiogram for yet another edition, this time by honing aesthetics, improving circuitry and adding multiroom support. Since the launch of the Ruark R7 in 2013, the speaker system has not only been single-handedly bringing the iconic radiogram up to date, but has also been deliberately rubbing out the line between audio product and piece of furniture. Indeed, we said in our Ruark R7 mk2 review that it was “the best sounding item of retro furniture we’ve ever heard”, despite not serving as one of the more capable-sounding solutions available for the money (£2000). With, as Ruark claims, ‘improved analogue circuitry’, the R7 mk3 could sound even better. But while the leap from the original R7 to the R7 mk2 was largely defined by amplifier upgrades and crossover changes, the margin this time has, it seems, been widened more by visual and feature upgrades than performance ones. For the R7 mk3, Ruark has worked even harder to make this as much of a visual product as an audio one. Available in a rich walnut or soft grey lacquer, it now has a slimmer profile, pine legs and a new fabric grille, the latter of which has undoubtedly been chosen to coincide with the contemporary design of the brand’s latest fare, such as the MR1 Mk2. Those sources can soon be controlled via your smartphone or tablet thanks to the R7’s forthcoming support for the ‘LINK’ app (compatible with Android and iOS), although until then there’s the physical RotoDial remote. The Ruark remains thoroughly equipped, with Spotify Connect support expanding its predecessor's exhaustive connection list further. It joins DAB/DAB+/FM and internet radio, a CD player, aptX Bluetooth and - last but not least - DLNA support for streaming from a laptop or NAS device. New multiroom functionality now means that the R7 can connect to the Ruark R2 and the brand's forthcoming MRx for multiple streaming in… multiple rooms. Digital and analogue connections are plentiful, with twin optical and single 3.5mm inputs joining three RCAs, one of which is dedicated for a turntable hook-up. There's also an analogue output, and a USB socket for playback and charging. Underneath that new grille are two 14cm dual-concentric drive units and a 20cm subwoofer, and the 160W total power still comes courtesy of a new redesigned class A/B amplifier. The Ruark R7 mk3 is available now and priced just north of its predecessor at £2300.